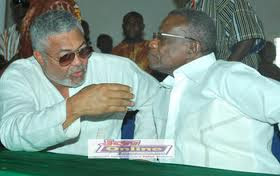 Former President Jerry John Rawlings yesterday charged on President John Evans Atta Mills accusing him of virtually bribing the National Democratic Congress (NDC) structures with goodies such as cars and cash. Firing from all cylinders at President John Evans Atta Mills in a late evening statement, the former president accused Mills of influencing grassroots supporters of the NDC “to malign and cast aspersions at people, especially Nana (Konadu) and I”. In the statement he personally signed, titled “Statement by Flt. Lt. Jerry Rawlings on a campaign of misinformation by elements within NDC, Presidency,” the former President who has been the lead critic of the Mills administration virtually declared war on the President saying that he (Rawlings) had an axe to grind with Milss for institutionalizing corruption. “Do I have a problem with President Mills? Yes, I do - His refusal to pursue the moral mandate of the people ¬ to reinstate truth, transparency and most of all justice into the fabric and psyche of the nation. This is leading to the institutionalisation of crime and corruption. Justice will be deformed,” he charged. According to Mr. Rawlings, while the presidency was pretending to be his friend, others had been sent out into towns and hamlets to undo him. The NDC founder who mellowed down for sometime now suddenly burst into action with the ballistic missile fired from some unknown direction after his relocation from his Ridge residence which was gutted by on Valentine’s Day this year. He noted “there is nothing divisive about speaking the truth. Some of these party officials, advisors and power mongers hovering around the presidency have lost touch with the reality on the ground”. He pointed out that some of these stories and promises were not only absurd but an insult to their intelligence. “Those living the reality on the ground should not allow themselves to be misused,” he stressed. By his statement, he urged all supporters of the NDC not to be deceived by the financial inducements being dangled before their eyes but instead to remain steadfast to the cause of the revolution that gave birth to the NDC. Mr. Rawlings also lambasted the administration of ex-President John Agyekum Kufuor, and what he described as the reluctance of President Mills to institute “credible and transparent investigations into the fraud and political killings, which were the benchmark of the Kufuor regime” which he said, “is leading to a sense of hopelessness, indifference and indiscipline. “Let me remind all concerned that we won all our elections and survived some of the most trying times of our nation’s history for as long as we did, bringing hope and relief to our people because of NDC’s values and principles. Abandoning these values will not only spell the doom of the government but the hopes and aspirations of our people,” he stated. Rawlings who appears to have lost total hope in the Mills administration, said “what has sustained some of us is our attachment to the principles of truth, justice and fair play ¬ it is not a vulgar quest for materialism, a trait better epitomized by the Kufuor regime but which has sadly been endorsed by people now masquerading as diehard NDC followers. leading to the clear discontent within the party and the nation at large.